I was excited to be featured on Athleta’s Chi Blog in a post called, “How to Wear Yoga Pants All Day.” Let’s face it, I’m pretty much an expert on the subject ;). And I have to say, the yoga pants featured really are so good – so soft and flattering. Here’s the feature, check it out and treat yourself to a pair of yoga pants because…it’s Wednesday? Like you need a reason! With Solstice and International Yoga Day coming up this weekend, we’ve got asanas on our minds. (If you’re looking to join in on the fun, check out ways to participate below!). That’s why we’re loving the Quest Chaturanga Capri – the perfect ally for any pose. The super soft feel of these pants left us thinking, how can we wear these all day long? We put together some of our favorite ways to wear the Quest Chaturanga Capri to take you from a morning walk to the mat to an afternoon bite (and maybe just a little longer). There’s a perfect moment that happens just before the rest of the world wakes up and you can take a quick stroll to set the day off right. You want your clothes to be able to move with your body as it wakes up and gets energized. We are loving this fire red Asana Tank and white Criss Cross Sweater so you’re ready for any kind of weather. Our tank features a curved shirttail hem to cover your (ahem) assets, if you’re not entirely comfortable walking around in yoga pants. And we promise you: the beyond soft French Terry fabric of this sweater will make it your new constant companion. Just grab your favorite juice and you’re ready to go. Want to be Solstice-ready? 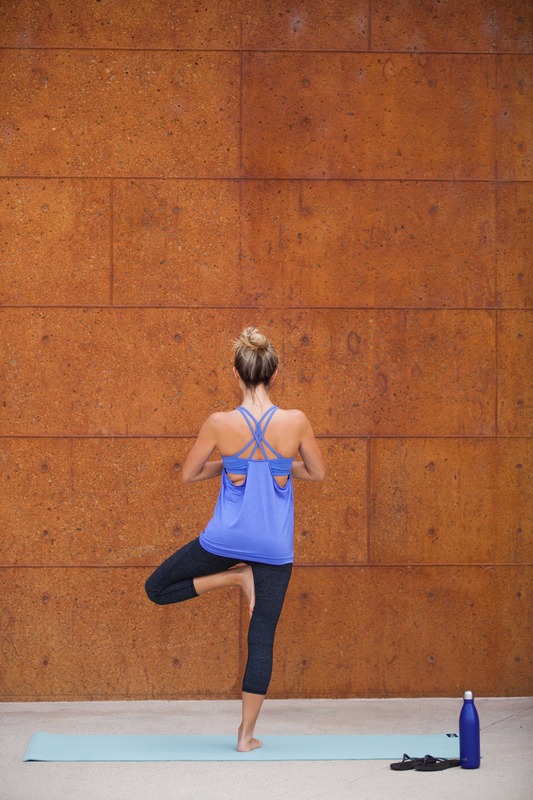 Pair our Mesh Energize Tank with Quest Chaturanga Capris for ultimate comfort. With built-in support, plus a semi-sheer billowy top, the tank frees you up to move through your vinyasa and provides plenty of ventilation. So you’ve let it all out on the mat, you feel loose and restored (and hungry!). Good news – these pants totally work for an afternoon lunch date. Just throw on a new shirt; we can’t get enough of the Limitless Crew Pullover. The mesh makes it ultra breathable, so sitting on the patio will feel like a breeze. We paired it here with a staff-fave staple: the Inner Goddess Tank, a support top in lightweight, stretchy fabric. Big thanks to Foxes and Wolves, Sew Creative Agency, and Athleta for making me a part of this post.